One of Europe’s largest Benedictine monasteries and a UNESCO World Heritage site, Catania’s Monastero dei Benedettini, or the Monastery of San Nicolò l’Arena, is among the city’s top attractions. The stunning monastery was founded in 1558 but almost completely rebuilt in the baroque style following an earthquake in the 18th century. One of Catania’s baroque treasures, the Monastero dei Benedettini is a highlight of walking and Segway tours of the city along with Piazza Duomo, the Cathedral of Sant’Agata, and the Elephant Fountain. Architecture enthusiasts will especially appreciate touring the palatial complex, which includes two magnificent internal cloisters and one of Sicily's most important libraries. This vast complex includes the small Church of St. Nicolò, where modest attire covering shoulders and knees is recommended. If visiting the monastery as part of a walking tour of Catania, opt for comfortable shoes and a sun hat. The monastery is accessible to wheelchair users. There is a bookshop, a small café, and a coat check in the monastery. The Monastero dei Benedettini is located in Catania’s historic city center, a short walk from the main Piazza Duomo and the Catania Centrale train station. Much of the monastery is indoors and can offer a welcome respite from Catania’s midday heat in the summer months. Visit the city’s outdoor attractions in the morning or afternoon, and stop in the cooler monastery when temperatures soar. 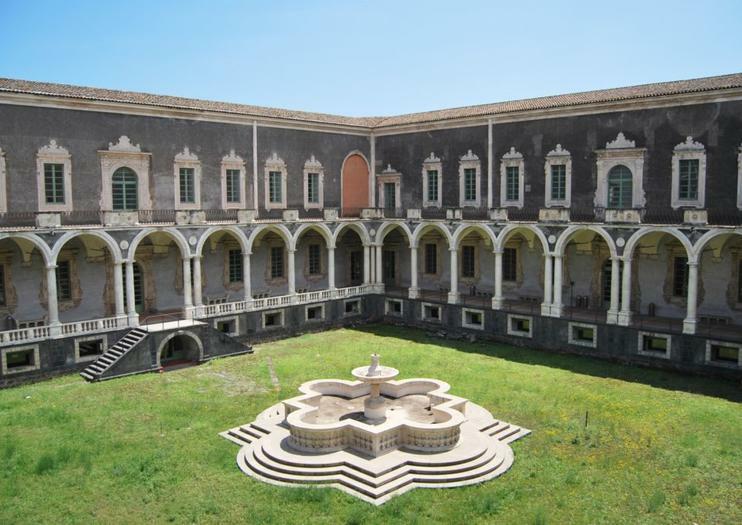 Today, Catania’s Benedictine Monastery is home to the Department of Humanities of the University of Catania, the Church of St. Nicolò, and the Museo della Fabbrica. This fascinating museum, which chronicles the building and architectural design of the complex, is housed in the cellars and kitchen designed by baroque architect Vaccarini. Additional highlights of the Monastero dei Benedettini include the remains of a Roman domus, a huge meridian clock, and a series of landscaped cloister gardens. Only A few minutes walk from the Cathedral of Catania there is the Church of San Benedetto, right in the middle of the famous baroque street called Via Crociferi. The church is considered a small Sicilian Sistine chapel because of the richness of its frescoes realized by Giovanni Tuccari, a painter from Messina, in the 18th century. But the church is not just a triumph of baroque painting, there is also a large choir that looks like a Spanish galleon, a huge and beautiful reminder of the secluded life of the cloistered nuns that still live here, and the famous Angels' staircaise made of marble and stucco. The Church of San Benedetto is also famous because it was part of the set for "Storia di una Capinera" by Franco Zeffirelli, a movie from the short story by Giovanni Verga.For the city of Catania it is a symbol of religious faith that reaches its peak during the festivities of Sant'Agata when the Benedictine nuns sing, for the patron saint, from the central gate. Discover one of Catania’s most important historical sites on this in-depth guided tour, with includes pre-booked admission tickets to the UNESCO-listed Benedictine Monastery of San Nicolò. Listen to how important events in Sicily’s history impacted the monastery, from volcanic eruptions to the unification of Italy. Visits include stops at both cloisters, the original 16th-century cellars, and the church’s main altar.